The Trump administration announced recently that it plans to open up all US coastal waters to offshore oil and gas drilling — with the exception of Florida where Trump’s property Mar al Lago is located. At the same time, Trump regulators are proposing to roll back safety measures put in place after the 2010 Deepwater Horizon blowout. That rollback would lessen government oversight in offshore oil production and put more responsibility on private companies. That didn’t work so well with BP’s Deepwater Horizon, where a 2010 explosion killed 11 people and caused the worst oil spill in American history. 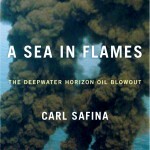 Back in 2011 on the first anniversary of the Deepwater Horizon spill, I spoke with conservation biologist and author Carl Safina about the book he’d just published, A Sea In Flames. We air an edited version of that interview here, followed by a conversation with Safina about Trump’s recent decision to open up US coastal waters to oil and gas drilling. In addition to A Sea In Flames, we’ve talked with Carl Safina about his books The View from Lazy Point and Beyond Words: How Animals Think And Feel.